PMD Magnetics supply the full range of Fujifilm Data Storage Media products, including all generations of Ultrium LTO and 3592 tape media. PMD Magnetics are the sole Fujifilm Data Storage UK Distributor for the Media & Entertainment market, which includes the supply of LTO8 LTO7 LTO6 LTO5 and LTO4 Ultrium tape media. Below is information about Fujifilm's pioneering tape technology and the latest generations of Ultrium LTO. 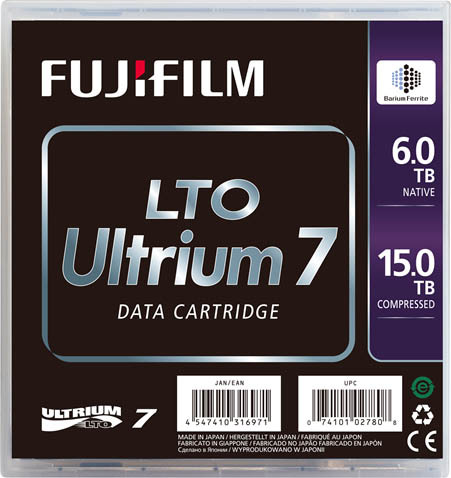 Fujifilm Bedford, United Kingdom, November 18, 2015 – FUJIFILM Corporation (President: Shigehiro Nakajima) announced that it will launch FUJIFILM LTO Ultrium 7 Data Cartridge (LTO7) on November 18, 2015. Adhering to the 7th generation “LTO Ultrium standards*1” for magnetic tape media, the LTO7 will allow for backup and archive of large volumes of data, high-speed data transfer at 750 MB/sec. (300 MB/sec.for non-compressed data), and offer a storage capacity of 15.0 TB (6.0 TB for non-compressed data). Recent technological developments have caused an exponential increase in the quantity of data generated worldwide. Such developments have included increases in data volume following the emergence of high-definition 4K and 8K video; the spread of supercomputer use in the areas of genetic analysis and drug development; and advances in the IoT (Internet of Things). At the same time, “cold-data", or data that is rarely accessed as time passes - is estimated to account for over 80% of all data. As the utilisation of accumulated big data rapidly increases, so does the need for reliable and cost effective long term storage of such data for future use. The use of magnetic tape is gaining in popularity, especially at major data centers, thanks to its storage capacity, portability, energy efficiency, total cost of ownership and suitability for long-term storage. The demand for magnetic tape is expected to increase as the volume of data generated globally doubles every two years. BaFe magnetic particles offer outstanding recording / retrieval performance and are suitable for long-term storage. The high coercivity, high signal to noise ratio and superior frequency characteristics make BaFe magnetic particles a cutting-edge technology that can help further increase the capacity of magnetic tape. Capitalising on years of R&D investment and expertise, Fujifilm was the first in the world to commercialise magnetic tapes using BaFe magnetic particles for enterprise systems in 2011. In 2012, Fujifilm introduced LTO Ultrium Data Cartridge which employed BaFe magnetic particles. Foreseeing the limitations posed on capacity by legacy metal magnetic particles, the prevalent technology at the time, Fujifilm's early commercialisation of magnetic tape using BaFe magnetic particles has allowed the company to consistently lead the market. Leveraging highly sophisticated BaFe magnetic particle technology, Fujifilm's BaFe particle-based magnetic tape shows stable and excellent performance regardless of the drive employed, and offers outstanding quality. With LTO7, Fujifilm has further developed its proprietary BaFe magnetic particle technology and “NANOCUBIC™ technology,*2” expanding storage capacity to about 2.4 times that of LTO6 at 15.0 TB for compressed data and making data transfers approximately 1.9 times faster, reaching 750 MB/sec for compressed data. Compared with LTO5, LTO6 capacity and transfer speed have increased by 1.7 and 1.1 times, respectively. The increase in performance from LTO6 to LTO7, however, vastly surpasses this gap. In order to boost the product's storage capacity, Fujifilm has achieved high-precision magnetic particle dispersion, has made the magnetic layers thinner, and has reduced minor defects for a better error rate. In this way, Fujifilm has successfully increased recording density by more than two times compared to LTO6. Furthermore, appropriate material design has allowed us to boost reliability, durability and tracking performance, while at the same time making the tape layers thinner and improving storage capacity. Moreover, Fujifilm's BaFe magnetic particles offer low variance in terms of magnetic properties, offering greater stability, and the ability to reliably store data for over thirty years has been verified. Since the launch of LTO1 in 2000, Fujifilm has been the leader in the development of high-capacity magnetic tape and is engaged in the constant pursuit of high performance and high quality as the world's top manufacturer*4. Fujifilm will continue to develop and provide high-performance, high-quality media and services to satisfy customers' needs and expectations, thereby helping to solve social issues. Tapes are 12.65 mm-wide and can record 3,584 tracks, reaching 15.0 TB for compressed data (or 6.0 TB for non-compressed data). For example, LTO7 allows recording two hours in the “4K DCI 24p 10bit” format that is used when editing 4K video. Also, the 32 channelã€€magnetic heads in the tape drive allow for high-speed data transfer reaching 750 MB/sec. for compressed data (or 300 MB/sec. for non-compressed data). The entire capacity can be transferred and restored in 5.6 hours. LTO7 employs “BaFe magnetic particles,” which were first commercialised by Fujifilm. Fujifilm's proprietary “NANOCUBIC™ technology” is designed to maximize the magnetic properties of BaFe magnetic particles. LTO7, with its high capacity and capability to store data for over 30 years, is optimal for economically storing large quantities of cold data over the long term. For example, assuming that 1 PB (petabyte) of data increases at a yearly rate of 55% and reaches 52 PB over nine years, the total cost incurred to store the data will be less than one sixth of the cost that would be incurred if using HDD. *5 With the magnetic tape, which is capable of being managed offline, valuable data can be stored safely and securely with minimum risk for data damage or loss due to system failures, viruses and cyber-attacks. LTFS is an open-standard file system format implemented from LTO5 onwards. The presence of a meta-data area on the tape itself allows customers to avoid dependence on vendor-specific backup software, and allows for cross-platform data exchanges. Data stored on magnetic tapes can be handled as files just as in the case of data on a HDD. Linear Tape-Open, LTO, the LTO logo, Ultrium and the Ultrium logo are registered trademarks of Hewlett Packard Enterprise, IBM and Quantum in the United States of America and in other countries. Fujifilm's proprietary ultra-thin layer coated magnetic tape technology allows high-density, high-capacity magnetic recording and consists of; nano-particle technology, which allows the micronizing of magnetic particles; nano-coating technology, which allows ultra-thin coating; and nano-dispersion technology, which allows the uniform dispersion and arrangement of micronized magnetic particles. As of November 18, 2015; data by Fujifilm. Manufacturer share; data by Fujifilm. Data provided by U.S. research agency The Clipper Group. All costs, including drive, server and other initial installation costs, maintenance costs and electricity cost are less than one sixth of those incurred if using HDD. Enterprise-class data storage systems require the use of media that offers both high capacity and extremely high reliability. Featuring Fujifilm's proprietary NANOCUBIC technology, our 3592 Tape Cartridge Series offers 500GB native capacity (1500GB, 3:1 data compressed) and a native transfer rate of 104MB/second. And Fujifilm tape products are recognized throughout the world as among the most reliable data storage products available.